Reader Don N. has taken a crack at improving on Shepard Fairey’s work a little. Give that America’s Dmitry Moor has a less than stellar track record, he probably won’t complain. Much. The caption is a tortured sentence. What is it even trying to say? Agreed. The 240kb .png isn’t helping anything either. My teacher sense is going off. Ummm… run on? It could take two from the Second Amendment, but at least that sentence is eay to understand. Isn’t it trying to be close to the poorly written original? no. I prefer the original. Wait, I am lost, which original? 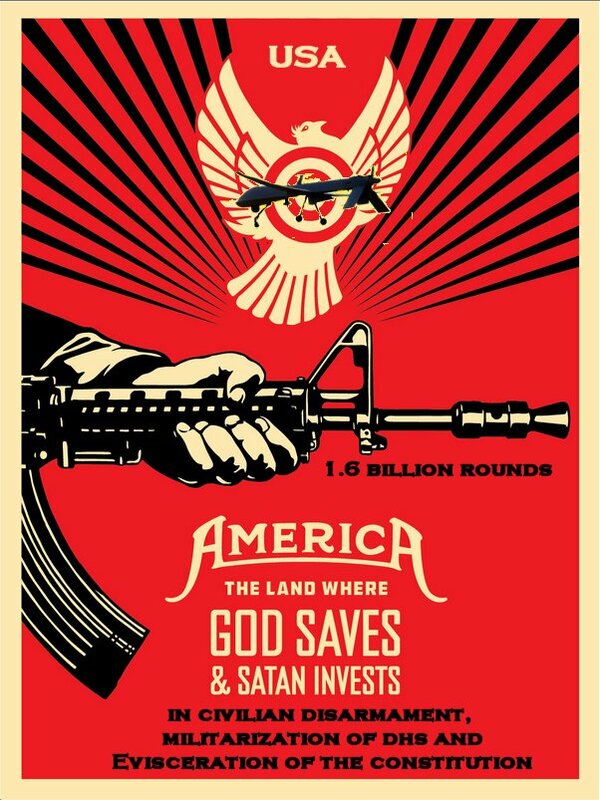 The first anti-NRA ad or some other one? Also, is the awful grammar an attempt to fool people into believing that the NRA is unintelligent? 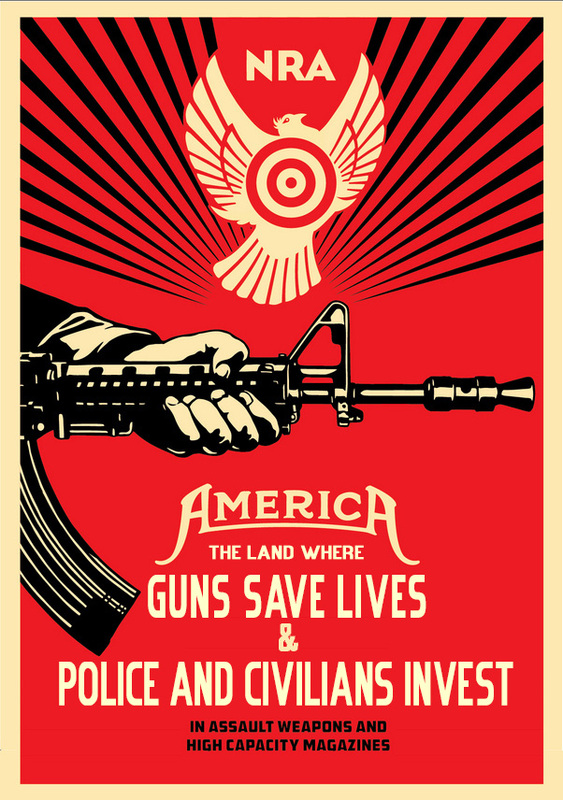 I prefer the Shepard one (the anti-nra one) even though I disagree with the message. For one thing the graphics are cooler. And the wording has a cool, succinct ring to it. It is a fine piece of propaganda, because it has hooks. This one, lacks the hooks. I wouldn’t be opposed to putting the original on my gun locker. 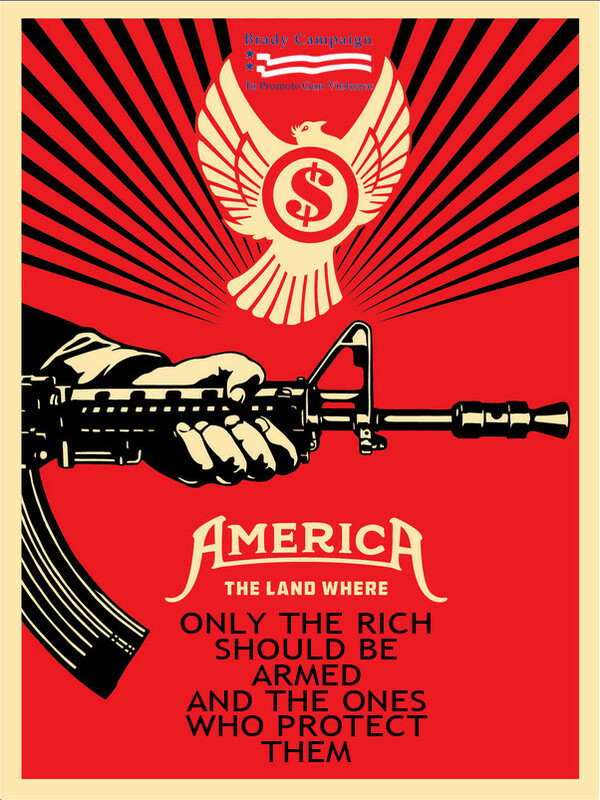 Similar to the way that as a free-marketeer I still enjoy the artwork of communist propaganda posters. This is great if you want more anti-gunners to believe were all just illiterate rednecks. Nice. Your work is at least readable, versus the grammatical mess printed above. My coworkers all understood it. Just a mess of ignorant redneck phd holding scientists, we are. 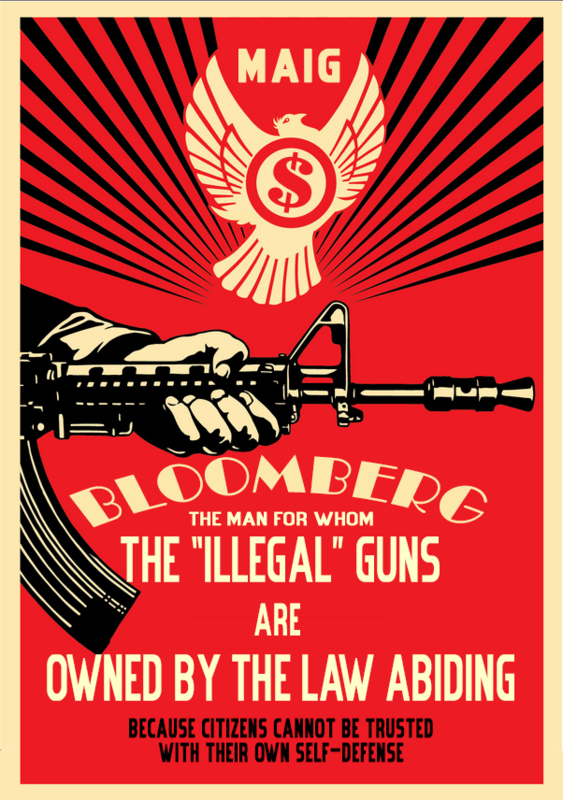 I like the Bloomberg one the best. Yeah, after seeing another post with the $ on here I made it and added it to the album. I believe it fits the propaganda theme pretty well. Needs work but the images with Bloomberg prominently highlighted are a hit. So who here like irony? Maybe Shepard’s right we don’t need assault weapons, we need sub machine guns! The gun grabbers have a new term for defensive gun usage. Now that is just classy. Luckily I’m wearing my decoder ring today! In the land of the free there are riflemen who go unrecognized in our commonplace lives. When the time comes to show force, be it defensive or otherwise, they’re pushed to the forefront of our attention as saviors. Once the commotion has settled these honorable people are forgotten once more until the day history repeats itself. Here you go. What a douchenozzle. Fairey being pleasant to his wife. Shepard Fairey, sticking his nose where it does not belong. oh wait he started his “career” illegally defacing private property? Clap if you believe in Fairey. bwahahaha! I refuse to use my weapons to preserve defective DNA…. The land of free riflemen–on whom you sometimes forget you depend–who are the last adults in the room and are needed to defend you disarmed people from tyranny every few decades. The land of free riflemen who stand constant vigil against the criminal and the tyrant. I hope Don N. doesn’t mind attempts to clean up his words. Certainly not. Better than condesending jabs. The point I was trying to convey in a single sentence is that the reason places like the UK can pretend they don’t need civilian gun ownership to maintain their freedom is that the US will always be there to bail them out. It’s like some child bragging to their dad that they don’t need a job because they can just get food from the kitchen. And looking at dad like he is crazy for going to work all day. You’re welcome. As a trained legal writer, I can say that everyone’s writing could use a boost every once in a while, mine included. I did love the point of your prose, but I was thinking more of the backyard gun grabbers than the Brits you called out. No matter, the only difference between all those pansies are their accents and beverage preferences.